This is a history of the economy of Italy. For more information on historical, cultural, demographic and sociological developments in Italy, see the chronological era articles in the template to the right. For more information on specific political and governmental regimes in Italy, see the Kingdom and Fascist regime articles. The Italian Renaissance was remarkable in economic development. Venice and Genoa were the trade pioneers, first as maritime republics and then as regional states, followed by Milan, Florence, and the rest of northern Italy. Reasons for their early development are for example the relative military safety of Venetian lagoons, the high population density and the institutional structure which inspired entrepreneurs. The Republic of Venice was the first real international financial center, which slowly emerged from the 9th century to its peak in the 14th century. Tradeable bonds as a commonly used type of security, were invented by the Italian city-states (such as Venice and Genoa) of the late medieval and early Renaissance periods. Between 17th and middle 19th century, Italy experienced a decline in relative economic standing. Military conflicts, political fractionalization, limited fiscal capacity and the shift of world trade to north-western Europe and the Americas are factors which slowed down Italian development. Terni steel mills in 1912. 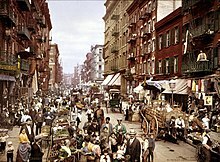 Little Italy, Manhattan, New York, ca.1900. The economic history of Italy after 1861 can be divided in three main phases: an initial period of struggle after the unification of the country, characterised by high emigration and stagnant growth; a central period of robust catch-up from the 1890s to the 1980s, interrupted by the Great Depression of the 1930s and the two world wars; and a final period of sluggish growth that has been exacerbated by a double-deep recession following the 2008 global financial crush, and from which the country is slowly reemerging only in recent years. Prior to unification, the economy of the many Italian statelets was overwhelmingly agrarian; however, the agricultural suprlus produced what historians call a "pre-industrial" transformation in North-western Italy starting from the 1820s, that led to a diffuse, if mostly artisanal, concentration of manufacturing activities, especially in Piedmont-Sardinia under the liberal rule of the Count of Cavour. After the birth of the unified Kingdom of Italy in 1861, there was a deep consciousness in the ruling class of the new country's backwardness, given that the per capita GDP expressed in PPS terms was roughly half of that of Britain and about 25% less than that of France and Germany. During the 1860s and 1870s, the manufacturing activity was backward and small-scale, while the oversized agrarian sector was the backbone of the national economy. The country lacked large coal and iron deposits and the population was largely illiterate. In the 1880s, a severe farm crisis led to the introduction of more modern farming techniques in the Po valley, while from 1878 to 1887 protectionist policies were introduced with the aim to establish a heavy industry base. Some large steel and iron works soon clustered around areas of high hydropower potential, notably the Alpine foothills and Umbria in central Italy, while Turin and Milan led a textile, chemical, engineering and banking boom and Genoa captured civil and military shipbuilding. However, the diffusion of industrialisation that characterised the northwestern area of the country largely excluded Venetia and, especially, the South. The resulting Italian diaspora involved 29 million Italians (10.2 million of whom returned) between 1860-1985 and 9 million permanently left of 14 million who emigrated between 1876–1914 two thirds of whom were men; by many scholars it is considered the biggest mass migration of contemporary times. During the Great War, the still frail Italian state successfully fought a modern war, being able of arming and training some 5 million recruits. But this result came at a terrible cost: by the end of the war, Italy had lost 700,000 soldiers and had a ballooning sovereign debt amounting to billions of lira. 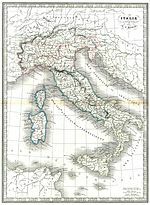 The unification of Italy in 1861–70 broke down the feudal land system that had survived in the south since the Middle Ages, especially where land had been the inalienable property of aristocrats, religious bodies, or the king. The breakdown of feudalism, however, and redistribution of land did not necessarily lead to small farmers in the south winding up with land of their own or land they could work and profit from. Many remained landless, and plots grew smaller and smaller and thus more and more unproductive as land was subdivided among heirs. The Italian diaspora did not affect all regions of the nation equally, principally low income agricultural areas with a high proportion of small peasant land holdings. In the second phase of emigration (1900 to World War I) most emigrants were from the south and most of them were from rural areas, driven off the land by inefficient land management policies. Robert Foerster, in Italian Emigration of our Times (1919) says, " [Emigration has been]…well nigh expulsion; it has been exodus, in the sense of depopulation; it has been characteristically permanent. ". Mezzadria, a form of sharefarming where tenant families obtained a plot to work on from an owner and kept a reasonable share of the profits, was more prevalent in central Italy, which is one of the reasons why there was less emigration from that part of Italy. Although owning land was the basic yardstick of wealth, farming in the south was socially despised. People did not invest in agricultural equipment but in such things as low-risk state bonds. 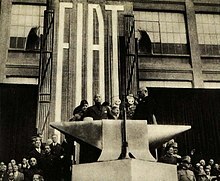 Benito Mussolini giving a speech at the Fiat Lingotto factory in Turin, 1932. Italy had emerged from World War I in a poor and weakened condition. The National Fascist Party of Benito Mussolini came to power in Italy in 1922, at the end of a period of social unrest. During the first four years of the new regime, from 1922 to 1925, the Fascist had a generally laissez-faire economic policy: they initially reduced taxes, regulations and trade restrictions on the whole. However, "once Mussolini acquired a firmer hold of power... laissez-faire was progressively abandoned in favour of government intervention, free trade was replaced by protectionism and economic objectives were increasingly couched in exhortations and military terminology." Italy reached a balanced budget in 1924–25 and was only partially hit by the 1929 crisis. The Fascist government nationalized the holdings of large banks which had accrued significant industrial securities, and a number of mixed entities were formed, whose purpose was to bring together representatives of the government and major businesses. These representatives discussed economic policy and manipulated prices and wages to satisfy both the wishes of the government and the wishes of business. This economic model based on a partnership between government and business was soon extended to the political sphere, in what came to be known as corporatism. Throughout the 1930s, the Italian economy maintained the corporatist and autarchic model that had been established during the Great Depression. At the same time, however, Mussolini had growing ambitions of extending Italy's foreign influence through both diplomacy and military intervention. After the invasion of Ethiopia, Italy began supplying troops and equipment to the Spanish nationalists under General Francisco Franco, who were fighting in the Spanish Civil War against a leftist government. These foreign interventions required increased military spending, and the Italian economy became increasingly subordinated to the needs of its armed forces. By 1939, Italy had the highest percentage of state-owned enterprises after the Soviet Union. Finally, Italy's involvement in World War II as a member of the Axis powers required the establishment of a war economy. This put severe strain on the corporatist model, since the war quickly started going badly for Italy and it became difficult for the government to persuade business leaders to finance what they saw as a military disaster. The Allied invasion of Italy in 1943 caused the Italian political structure—and the economy—to rapidly collapse. The Allies, on the one hand, and the Germans on the other, took over the administration of the areas of Italy under their control. By the end of the war the Italian economy had been destroyed. The Italian economy has had very variable growth. In the 1950s and early 1960s, the Italian economy was booming, with record high growth rates, including 6.4% in 1959, 5.8% in 1960, 6.8% in 1961, and 6.1% in 1962. This rapid and sustained growth was due to the ambitions of several Italian businesspeople, the opening of new industries (helped by the discovery of hydrocarbons, made for iron and steel, in the Po valley), re-construction and modernisation of most Italian cities, such as Milan, Rome and Turin, and the aid given to the country after World War II (notably the Marshall Plan). After 1964, Italy maintained for a while a constant growth rate of above 8% every year. Despite this, due to political, economical and social problems in the country during the late-1960s and most of the 1970s, the economy went stagnant and entered its first recession after that of the late-1940s. The problems included an increasingly high inflation rate, high energy prices (Italy is highly dependent on foreign oil and natural gas resources). This economic recession went on into the early-1980s until a reduction of public costs and spendings, tighter budgets and deficits, a steady economic growth, and a lowered inflation rate resulted in Italy left recession by 1983 as a result of this recovery plan. This plan led to an increasing GDP growth, lower inflation, and increased industrial/agricultural/commercial produce, exports and output, yet made the unemployment rate rise. A decrease in energy prices and lowered value of the dollar led to foreign exchange being liberalised and the economy to re-grow rapidly. As a matter of fact, in 1987, Italy had a period when it surpassed the British economy, becoming the sixth in the world. The 1970s and 1980s was also the period of investment and rapid economic growth in the South, unlike Northern and Central Italy which mainly grew in the 1950s and early 1960s. The "Vanoni Plan" ensured that a new programme to help growth in the South called "Cassa per il Mezzogiorno" (Funds for the "Mezzogiorno" (a slang for Southern Italy, literally meaning "midday") was put in place. Investment was worth billions of US dollars: from 1951–1978, the funds spent in the South was $11.5 billion for infrastructure, $13 billion for low-cost loans, and outrighted grants were worth $3.2 billion. On 15 May 1991, Italy became the fourth worldwide economic power, overcoming France, called the "secondo sorpasso" with a GDP of US$1.268 trillion, compared to France's GDP of US$1.209 trillion and Britain's of US$1.087 trillion. Despite the alleged 1987 GDP growth of 18% according to the Economist's  Italy was then re-overtaken by all countries due to currency value change. By the 1990s, the Italian government was fighting to lower the internal and external debt, liberalise the economy, reduce governmental spending, selling business and enterprises owned by the state, and trying to stop tax evasion; the liberalisation of the economy meant that Italy was able to enter the EMU (European Monetary Union) and it later, in 1999, qualified to enter the eurozone. However, the main problem which plagued the 1990s, and still plagues the economy today, was tax evasion and underground "black market" business, whose value is an estimated 25% of the country's gross domestic product. Despite social and political attempts to reduce the difference in wealth between the North and South, and Southern Italy's modernisation, the economic gap remained still pretty wide. In the 1990s, and still today, Italy's strength was not the big enterprises or corporation, but small to middle-sized family owned businesses and industries, which mainly operated in the North-Western "economic/industrial triangle" (Milan-Turin-Genoa). Italy's companies are comparatively smaller than those of similar countries in size or of the EU, and rather than the common trend of less, yet bigger businesses, Italy concentrated on more, yet smaller enterprises. This can be seen in the fact, that the average workers per company in the country is of 3.6 employees (8.7 for industrial/manufacturing-orientated businesses), compared to the Western European Union average of 15 workers. In the recent decades, however, Italy's economic growth has been particularly stagnant, with an average of 1.23% compared to an EU average of 2.28%. Previously, Italy's economy had accelerated from 0.7% growth in 1996 to 1.4% in 1999 and continued to rise to about 2.90% in 2000, which was closer to the EU projected growth rate of 3.10%. We find no evidence that this slowdown is due to trade dynamics, Italy’s inefficient governmental apparatus, or excessively protective labor regulations. By contrast, the data suggest that Italy’s slowdown was more likely caused by the failure of its firms to take full advantage of the ICT revolution. While many institutional features can account for this failure, a prominent one is the lack of meritocracy in the selection and rewarding of managers. Familyism and cronyism are the ultimate causes of the Italian disease. A graph showing Italy's GDP growth from 2000 to 2012 (including predictions of 2013) compared with EU's growth. Italy's economy in the 21st century has been mixed, experiencing both relative economic growth and stagnation, recession and stability. In the late 2000s recession, Italy was one of a few countries whose economy did not contract dramatically, and kept a relatively stable economic growth, although figures for economic growth in 2009 and 2010 averaged in the negatives, ranging from around -1% to -5%. The late-first decade of the 21st century recession has also gripped Italy; car sales in Italy have fallen by almost 20 percent over each of the past two months. Italy's car workers' union said; "The situation is evidently more serious than had been understood." On 10 July 2008 economic think tank ISAE lowered its growth forecast for Italy to 0.4 percent from 0.5 percent and cut the 2009 outlook to 0.7 percent from 1.2 percent. Analysts have predicted Italy had entered a recession in the second quarter or would enter one by the end of the year with business confidence at its lowest levels since the September 11 attacks. Italy's economy contracted by 0.3 percent in the second quarter of 2008. In the 4 quarters of 2006, Italy's growth rates were approximately these: +0.6% in the Q1, +0.6% in the Q2, +0.65% in the Q3, and +1% in the Q4. Similarly, in 2007's 4 quarters, these were the figures: +0.25% in the Q1, +0.1% in the Q2, +0.2% in the Q3, and -0.5% in the Q4. In the 4 of 2008's quarters, the results, mainly negative, were these: +0.5% in the Q1, -0.6% in the Q2, -0.65% in the Q3 and -2.2% in the Q4. In the Q1 (1st quarter) of 2009, Italy's economy contracted by 4.9%, a greater contraction than the predictions of the Italian government, which believed that it would be of at most 4.8%. The Q2 (2nd quarter) saw a smaller decrease in GDP, more or less that of -1%, and by the Q3 (3rd quarter), the economy began to re-grow slightly, with GDP increase rates of about +0.2% to +0.6%. Yet, in the Q4 (4th quarter) of the year 2009, Italy's GDP growth was of -0.2%. ISTAT predicts that Italy's falling economic growth rate is due to a general decrease in the country's industrial production and exports. However, the Government of Italy believes that 2010 and beyond will bring higher growth rates: anything from circa +0.7% – +1.1%. A table showing Italy's GDP per capita (PPP) growth from 2000 to 2008. ^ Baten, Jörg (2016). A History of the Global Economy. From 1500 to the Present. Cambridge University Press. p. 44. ISBN 9781107507180. ^ Coispeau, Olivier (2016-08-10). Finance Masters: A Brief History of International Financial Centers in the Last Millennium. World Scientific. ISBN 9789813108844. ^ Baten, Jörg (2016). A History of the Global Economy. From 1500 to the Present. Cambridge University Press. p. 45. ISBN 9781107507180. ^ Riall, Lucy (1999). The Italian risorgimento : state, society, and national unification (Repr. ed.). London [u.a. ]: Routledge. p. 53. ISBN 978-0415057752. ^ Killinger, Charles L. (2002). The history of Italy ([Online-Ausg.] ed.). Westport, Conn. [u.a. ]: Greenwood Press. p. 112. ISBN 978-0313314834. ^ Zamagni, Vera (1993). The economic history of Italy, 1860-1990 : from the periphery to the centre (Repr. ed.). [New York]: Clarendon Press. p. 64. ISBN 978-0198287735. ^ Kemp, Tom (1985). Industrialization in nineteenth-century Europe (2nd ed.). London: Longman. ISBN 978-0582493841. ^ Ciccarelli, Carlo; Fenoaltea, Stefano (July 2010). "Through the Magnifying Glass: Provincial Aspects of Industrial Growth in Post-Unification Italy" (PDF). Banca d'Italia. p. 4. ^ Cohen, Robin (1995). The Cambridge Survey of World Migration. Cambridge: Cambridge University Press. p. 114. ISBN 0-521-44405-5. Retrieved 8 February 2015. ^ Clark, Martin (1984). Modern Italy, 1871-1982. New York: Longman. p. 186. ISBN 0-582-48361-1. Retrieved 8 February 2015. ^ a b McDonald, J.S. (October 1958). "Some Socio-Economic Emigration Differentials in Rural Italy, 1902-1913". Economic Development and Cultural Change . 7 (1): 55–72. doi:10.1086/449779. ISSN 0013-0079. ^ Cited in Abbott, Edith; Foerster, Robert F. (August 1920). "Review of: Italian Emigration of our Times by Robert Foerster (1919)". The American Political Science Review. American Political Science Association. 14 (3): 523–524. doi:10.2307/1946285. ISSN 0003-0554. JSTOR 1946285. ^ Knight, Patricia (2003). Mussolini and Fascism. Routledge. p. 64. ^ Mattesini, Fabrizio; Quintieri, Beniamino (1997). "Italy and the Great Depression: An analysis of the Italian economy, 1929–1936". Explorations in Economic History. 34 (3): 265–294. doi:10.1006/exeh.1997.0672. ^ Mattesini, Fabrizio; Quintieri, Beniamino (2006). "Does a reduction in the length of the working week reduce unemployment? Some evidence from the Italian economy during the Great Depression". Explorations in Economic History. 43 (3): 413–437. doi:10.1016/j.eeh.2005.04.001. ^ "Italy - Facts, Geography, & History". ^ a b c d e f g h i j k "Economic development - Italy - tax, problem, average, growth, system, infrastructure, policy, sector". www.nationsencyclopedia.com. ^ "L'Italia supera Gran Bretagna in classifica Pil pro-capite". ^ Brignolo, Massimo (27 March 2009). "Il sorpasso che non ti aspetti: l'Italia supera la Gran Bretagna". vistidalontano.blogosfere.it. Blogo.it Srl. Archived from the original on 10 October 2013. Retrieved 8 August 2016. ^ Pellegrino, Bruno; Zingales, Luigi (October 2017). "Diagnosing the Italian Disease". NBER Working Paper No. 23964. doi:10.3386/w23964. ^ Evans-Pritchard, Ambrose (2008-07-11). "Recession warnings ruffle Europe as Germany and Italy stall". London: Daily Telegraph. Retrieved 2008-07-19. ^ "Italy's Economy Unexpectedly Shrinks; Nears Recession". Bloomberg. 2008-08-08. Retrieved 2008-08-11. ^ a b c d e f g "Italian Economy Watch". italyeconomicinfo.blogspot.com. Ahearn, Brian (2003). "Anthropometric evidence on living standards in northern Italy, 1730–1860". Journal of Economic History. 63 (2): 351–381. doi:10.1017/S0022050703001827. Fenoaltea, Stefano (2003). "Notes on the rate of industrial growth in Italy, 1861–1913". Journal of Economic History. 63 (3): 695–735. doi:10.1017/S0022050703541961. Fenoaltea, Stefano (2005). "The growth of the Italian economy, 1861–1913: preliminary second-generation estimates". European Review of Economic History. 9 (3): 273–312. doi:10.1017/S136149160500153X. Hassan; Ottoviano (2018). "Poor productivity: an Italian perspective". CentrePiece. Herlihy, David; Lopez, Robert S.; Slessarev, Vsevolod, eds. (1969). Economy, Society and Government in Medieval Italy. Luzzatto, Gino (1961). An economic history of Italy: from the fall of the Roman Empire to the beginning of the sixteenth century. Routledge & Kegan Paul. Malanima, Paolo (2011). "The long decline of a leading economy: GDP in central and northern Italy, 1300–1913". European Review of Economic History. 15 (2): 169–219. doi:10.1017/S136149161000016X. Milward, Alan S.; Saul, S. B. (1977). The Development of the Economies of Continental Europe: 1850–1914. pp. 215–270. ISBN 0-04-330277-7. Milward, Alan S.; Saul, S. B. (1979). The Economic Development of Continental Europe 1780–1870 (2nd ed.). ISBN 0-04-330299-8. Toniolo, Gianni (1990). An economic history of liberal Italy 1850–1918. London: Routledge. ISBN 0-415-03500-7. Zamagni, Vera (1993). The economic history of Italy 1860–1990. Oxford University Press. ISBN 0-19-828773-9. This page was last edited on 8 April 2019, at 20:47 (UTC).